Paris is a major international city that is over 2000 years old. It has seen more art movements than most of us can list and it continues to influence the art world today. 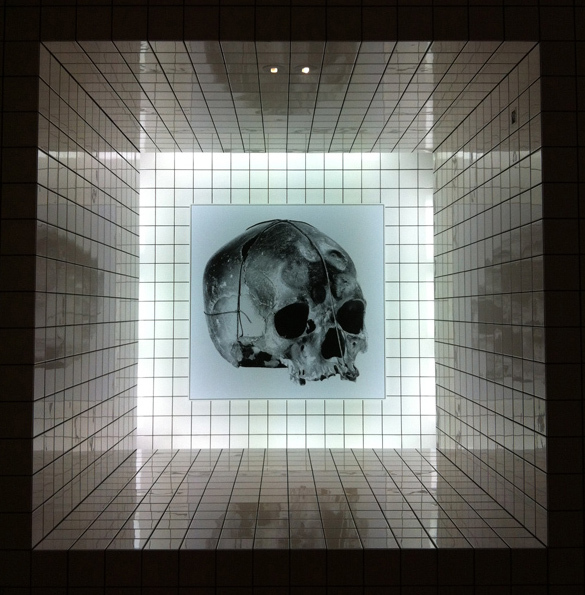 When you come to Paris to experience contemporary art, you will discover more than just French artists. Just as at the ‘fin de siècle’ of the 19th century brought great artists from every corner of Europe and North America, Paris maintains the ability to attract top international artists who exhibit in their many prestigious established and cutting-edge venues alike. At every major international art fair, such as those produced by Frieze or Art Basel, Parisian art dealers have a clear and strong presence. Powerhouse dealers from other countries flock to establish a presence in Paris, drawing in big names like London’s Gagosian, NYC’s Marian Goodman and Salzburg’s Thaddaeus Ropac. With three major international art fairs per year – Art Paris, FIAC (Foire Internationale d'Art Contemporain), and Paris Photo, with the latter two establishing annual venues in L.A., Paris is a major hub on the European and international art markets. This June I had the opportunity to visit Paris once again, only this time I brought a dozen art collectors from the Contemporary Art Society of Vancouver (CASV) with me. As a Director of the CASV and an avid Francophile, I wanted to share my passion for the contemporary art scene of Paris with a Canadian audience. This tour represents the last 6 months of my life: 5 months of preliminary planning, 15 exceptional hosts, and 5 days of fantastic French contemporary art experiences! As we know, the traditional modes of presentation for contemporary art have evolved. Although the model of the “white cube’ still has it’s place, particularly in commercial galleries, Paris persistently features innovative and decisively “unfinished” experimental venues for it’s presentations. The Palais de Tokyo brings this hip new aesthetic into it’s 1936 re-purposed building format, perhaps drawing from a similar “unfinished” aesthetic that has been made popular in art works that reveal their own creative process. On the other end of the spectrum Parisians also find contemporary art in places dedicated to history, such as the Chateau Versailles, now a public museum that serves as a reminder of the wealth, opulence and ultimately, the abuse of power of the last great French monarchs before the Revolution. Through an annual program of contemporary art installations, Chateau Versailles has featured exhibitions by artists Jeff Koons, Bernar Venet, Takashi Murakami, Xavier Veilhan and others. We were fortunate to meet and attend a private studio visit with Xavier Veilhan while in Paris as well as with Jean-Michel Othoniel, who is currently working on a permanent installation at Versailles. One of the most obvious aspects of the contemporary art scene of Paris is it’s extraordinary funding. While the French will quickly remind you of any recent cutbacks, they often don’t realize how good they really have it in comparison to other countries. They are constantly immersed in an environment where art is everywhere to be discovered. You don’t have to have money to enjoy art – it can be seen at above ground metro station entrances, in the metro itself, throughout the parks, installed in major department stores, and just about anywhere you look. Also, most museums offer a monthly “free day”. France is after all “the mother of the arts”. It is no wonder that French citizens are more than willing to support cultural endeavors through public support as well. One of the highlights of our tour was a day trip to nearby Reims to see the innovative installation of the FRAC (Fonds Régional d'Art Contemporain) Champagne-Ardenne collection. The Director of the FRAC, Florence Derieux, has collaborated with Vranken Pommery, who has allowed her to create an extensive intervention on the estate integrating the collection into the vast network of underground Gallo-Roman chalk caves where the champagne is aged. This exhibition celebrates the 30th anniversary of the FRAC Champagne-Ardenne. The FRAC Director, with the cooperation of Madame Pommery, hosted the CASV for a very memorable private tour and champagne tasting. Aside from government support, there exist a number of foundations that also offer support for the arts; they are often created and funded by globally renowned French luxury designer brands, liquor distributors and other corporations. In the five-day intensive tour that we had in Paris, we were only able to scratch the surface of their existence. We were graciously invited by the Directors for private tours at both the Foundation Cartier pour l'Art Contemporain, which is currently celebrating their 30th Anniversary, and behind the scenes at L’Espace Culturel Louis Vuitton. This fall will witness the opening of the Foundation Louis Vuitton in Paris’ Bois-de-Boulogne, built by world-renowned architect Frank Gehry and funded by the French luxury brand LVMH. One of the most impressive aspects of French support for contemporary art is through their collaborations with fashion. Artists like Jean Pierre Raynaud and Jean-Michel Othoniel, both of whose studios we had the opportunity for private visits at, have received commissions or done collaborations with world-renowned fashion designers. The first time that I encountered the sculptural work of Othoniel was in the window of an Yves Saint Laurent boutique in SoHo, NYC, circa 2000. Jean Pierre Raynaud’s most famous work, La Maison, has been the setting for important fashion photo shoots. Even though La Maison has been destroyed, he recently collaborated with French fashion design duo Piece d’Anarchive in a large-scale collaborative installation at the Palais de Tokyo where he filled 64 stainless steel buckets with the demolished remains of La Maison. And of course, Louis Vuitton has famously collaborated with contemporary artists like Takashi Murakami for a product line, and more recently, with Yayoi Kusama. The fusion of art with design serves to make it a bit more fashionable, potentially bringing in a younger wave of art collectors. So what about the work itself? What defines French art today? With such a great diversity of artists working in different directions, there is no easy answer.. However, I will say this – installation is king! With sculpture a close second, the two are often inseparable. Visual art is no longer the stand-alone snob of the arts; collaborations are prolific, merging indiscriminately with musicians, fashion designers, and just about any other creative genre. Following a studio visit with French artist Xavier Veilhan, he invited us to attend a concert being held in the installation "On/Off" that he had created at the popular Galeries Lafayette department store in their dedicated exhibition space, Galeries des Galeries, re-creating the space using old make-up kiosks with the brand names removed. 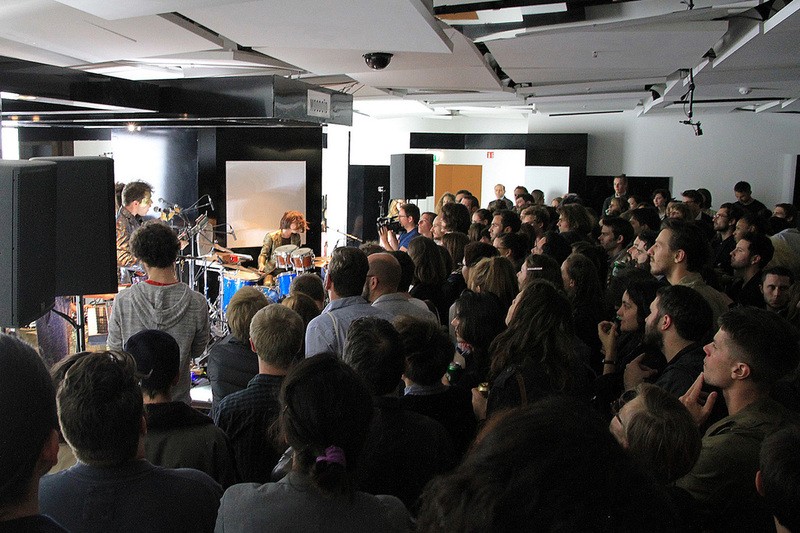 When the space was "On" it was packed with performers and their audiences and at "Off" times, the space could be explored in more subdued, intimate manner. With such a great myriad of cultural diversity, is there anything missing? As I neared completion of my itinerary for the contemporary art tour of Paris, I gradually became aware that there was a notable absence of women artists featured in my program. After reaching out to dozens of private art foundations, top gallerists, collectors, and art patrons, none of them had offered me anything that featured women artists. Adamant that this was not the image of Paris that I wanted to portray, I scoured the websites of my contacts again. Shortly afterwards, I received word from the Director of L’Espace Culturel Louis Vuitton that we were invited to visit their space and that the new artist in residence, Andrea Bowers, a feminist artist from L.A., would be arriving just prior to our tour. Unfortunately, as she had just begun her residency, there was not yet any of her works to be seen when we toured the space. One of my favorite gallerists, Emmanuel Perrotin, was scheduled to have an exhibit up during our stay in Paris that peaked my interest. To offer a bit of background, Emmanuel Perrotin has become somewhat of an art world celebrity in his own right. It is he who launched the very successful career of Japanese artist Takashi Murakami. Perrotin also represents a stable of other internationally acclaimed artists, such as Maurizio Cattelan, who covered the façade of the central pavilion of the 2011 Venice Biennale in taxidermied pigeons. Both artists represent an aesthetic of playfulness that make it unsurprising that Perrotin once had a gallery in Miami, host city of the annual Art Basel Miami Beach fair that draws blue chip art collectors, celebrities and art world glitterati to a place where “fun” is the new chic. It was in Miami that Perrotin met pop music star, Pharrell Williams, an avid art collector, and the guest curator of the current show “GIRL” in the Perrotin’s Paris, Salle de Bal location. The title of the show “GIRL” gave me new hope in discovering new talents in contemporary French female artists. Sidelining the feminist interpretation in my head over the derogatory nature of the term “girl” being used when referring to grown women, I scheduled a private tour of the exhibit for the CASV. The exhibit contained token works by famed female artists Marina Abramovich, Tracey Emin, Sophie Calle, Yoko Ono and Cindy Sherman. However, out of the 37 artists exhibited in the show, only 18 were women. The others were men who paid homage to their vision of women, or evidently, homage to Pharrell Williams. 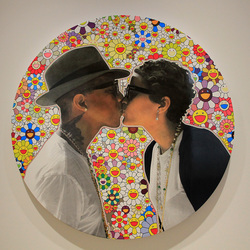 I counted 7 works created for or based on the curator, Pharrell Williams. While I am of the belief that a curator should never steal the show from the artists they are exhibiting, Emmanuel Perrotin has been in this business a lot longer than I have. He knows first and foremost that art is business, and secondly, that the cult of celebrity is big business. Coming to Paris with a great respect for Perrotin and the lengths that he has gone to support his artists, I left with a somewhat jaded perspective. But, at the end of the day, if his modus operandi gets more media attention for his artists, should it be criticized? And, how can one begin to criticize a dealer who welcomes the critique of himself by the artists he shows. (see bottom right) The Guerilla Girls message proves to be as relevant today as it was when I first learned of their work during art school back in the 90’s. As my contemporary art tour of Paris with the CASV concluded, I left somewhat disheartened. The older I get the more I become aware of that as a women, I am not equal, and we still have a long ways to go. Following Paris, my French vacation took me to the Cote d’Azure and Provence, where museums and exhibits dedicated to the “heroic” male artists who had once lived there, were prolific – Picasso, Matisse, Chagall, Miro (at the Foundation Maeght) Van Gogh, Cezanne, and in Monaco, Gilbert and George. Reluctant to criticize France, I had to ask myself – are we in Canada any better? After all, who comes to mind when we think of Vancouver's most internationally acclaimed artists? As I unpacked my suitcase upon my arrival back in Vancouver, I took out a stack of catalogues that had been given to me along the way. I sat down with a coffee to read the first one – a catalogue of the 2013 Prix Marcel Duchamp/Duchamp Prize nominees. The Duchamp Prize is a great honour to receive in France, the equivalent to the Turner Prize in the U.K. One of the most exceptional hosts that I’d had the honour of working on this tour with, Gilles Fuchs, is one of the founders of ADIAF, who created the Duchamp Prize. As one of the initiators and key patrons of the Prize, Fuchs is also on the jury. I knew the 2013 winner to be Latifa Echakch, but to my delight, she was one of 3 women who were nominated for the Prix Marcel Duchamp, out of 4 last year! Gilles Fuchs had been one of our favourite hosts with his warm personality, exceptional generosity, many well-established connections and dedication to contemporary art. So although women may not have equality in the arts yet, perhaps there is hope.